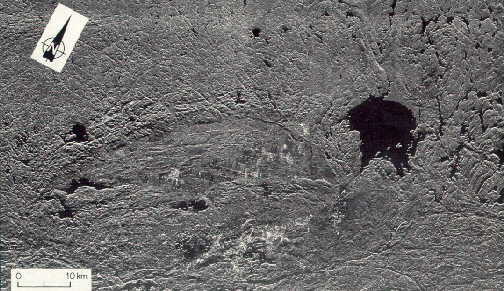 Aerial Radar Image - Sudbury crater is the large depression middle left. Wanapitei crater is the dark lake middle right. cm. 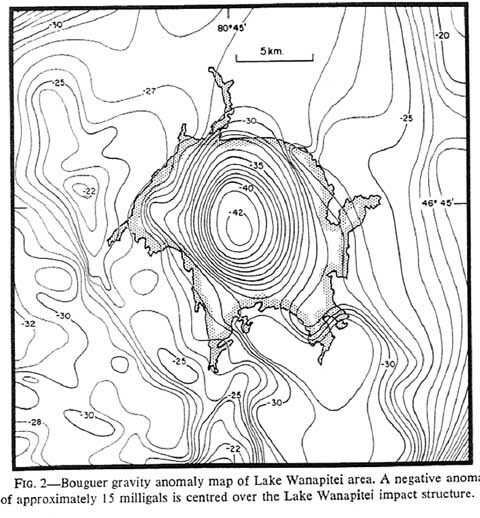 Geophysical evidence is in the form of a circular gravity low of ~15 mgal, documented in this Bouguer gravity anomaly map (Note 7). 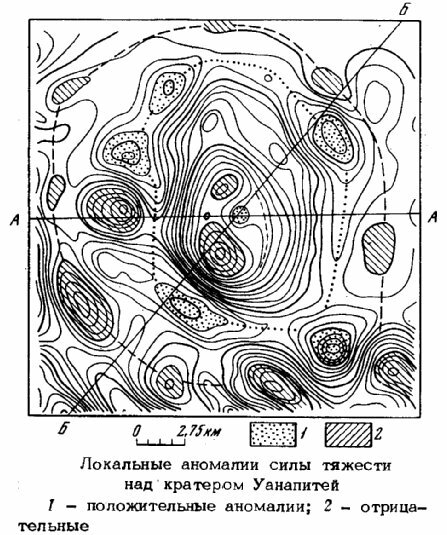 The low is observed over the north-central, island free area of the lake. 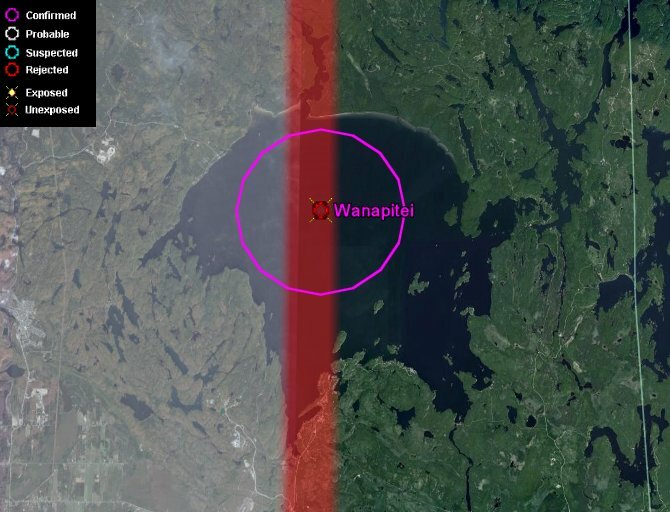 This gravity anomaly reinforces the meteoritic origin of this structure similar to other structures ( West Hawk, Brent) that have been identified as impact events by similar gravity anomalies. cm. ьФБ ХДБТОБС УФТХЛФХТБ ДЙБНЕФТПН ПЛ. 7,5 ЛН ГЕМЙЛПН ЪБРПМОЕОБ ПЪЕТПН Й МЙФПМПЗЙС ЙНРБЛФЙФПЧ ЙУУМЕДХЕФУС ФПМШЛП РП ПВТ. ЗМСГЙБМШОЩИ ПФМПЦЕОЙК. пРЙУЩЧБАФУС ЪАЧЙФПЧЩЕ ВТЕЛЮЙЙ, УЙМШОП ХДБТОП РТЕПВТБЪПЧБООЩЕ НЕФБПУБДЛЙ, УФЕЛМПЧБФЩЕ ВТЕЛЮЙЙ Й ХДБТОП ТБУРМБЧОЩЕ РПТПДЩ. чБМПЧЩК УПУФБЧ РПУМЕДОЙИ НПДЕМЙТХЕФУС ЛБЛ ЗЕПМПЗЙЮЕУЛЙ ТБЪХНОБС УНЕУШ ЛПОЛТЕФОЩИ МЙФПМПЗЙЮЕУЛЙИ ТБЪОПУФЕК ЧЕТПСФОЩИ РПТПД НЙЫЕОЙ. дЧБ УФТХЛФХТОП-НЙОЕТБМПЗЙЮЕУЛЙИ ФЙРБ ХДБТОП ТБУРМБЧОЩИ РПТПД ТБЪМЙЮБАФУС Й ХТПЧОЕН ЪБЗТСЪОЕОЙС НЕФЕПТЙФОЩН ЧЕЭЕУФЧПН. дМС ПДОПЗП ЙЪ ОЙИ УППФОПЫЕОЙЕ ЬМЕНЕОФПЧ ПФЧЕЮБЕФ НПДЕМЙ ИПОДТЙФПЧПЗП ХДБТОЙЛБ, ДМС ДТ. ЪБЗТСЪОЕОЙЕ НЕФЕПТЙФОЩН ЧЕЭЕУФЧПН Ч 5 ТБЪ ЧЩЫЕ. рТЙЮЙОБ ЬФПЗП ОЕ СУОБ, ОП НПЦЕФ УМХЦЙФШ РТЕДПУФЕТЕЦЕОЙЕН РТЙ ЙОФЕТРТЕФБГЙЙ ЙУФПТЙЙ ХДБТОЩИ УПВЩФЙК РП ДБООЩН П ЧЕЭЕУФЧЕ ВЕЪ ДПМЦОПЗП ЗЕПМПЗЙЮЕУЛПЗП ЛПОФТПМС. (Grieve R.A.F., Ber T., 1994).